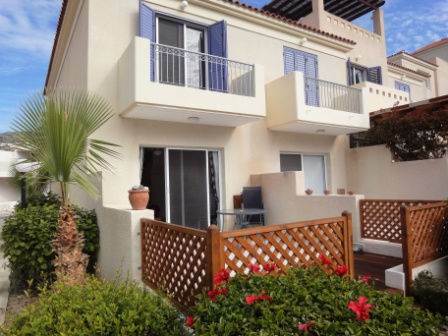 Cyprus Property Blog by Cleo : New on the Market - Property in Peyia with Sea Views - NOW SOLD!! • 87 sq. m., 2 bath, 2 bdrm townhouse "End Unit" - €139,000 EUR - Sea Views - NOW SOLD! Peyia, Paphos - This spacious end townhouse is located in the popular area of Peyia, not far from the village itself, which has a wide variety of local amenities. The popular beach of Coral Bay is a few minute’s drive away. The ground floor features a split level open plan living area, with lounge, dining area, corner kitchen, guest toilet and under stairs storage cupboard. The kitchen is well equipped with fridge/freezer, washing machine, built-in oven, electric hob and extractor fan, and there is space for a dishwasher also. Patio doors open from the lounge onto a large terrace with decking. Upstairs there are two double bedrooms, both with fitted wardrobes, and a good size shower room. Patio doors open from the master bedroom on to a balcony overlooking the swimming pool and landscaped gardens, and there is a lovely sea view from here. The project is very well maintained with changing room, toilet and outdoor tiled shower at the side of the swimming pool. For parking, there are two car parks provided. The specification of this property is high with many extras included such as double glazing, fly screens, shutters, ceiling fans, air conditioning, satellite and much more. It is being offered for sale fully furnished.